In 1986 the Hilton Head Museum funded Chicora Foundation archaeologists to examine a portion of the Mitchelville site that was in danger of being destroyed by development. That study provides the best archaeological account of the village we have and helps supplement the historical record. Pictured: Artifacts of Slavery and Freedom. Upper left, annular ware bowl, frequently given to slaves by their masters. Upper right, a slate "pencil," for writing on slate tablets and used by the freedmen in school. Lower left, a Union button, perhaps lost by a soldier at Mitchelville. Lower right, a whiteware cup, probably purchased by a freedman from one of the stores operating in Mitchelville. The archaeologists explored four different houses on the property, finding not only evidence of fancy artifacts, probably looted from plantation houses, but also ample evidence of the consumer power of the freedmen. The blacks at Mitchelville turned their backs on many of the artifacts of slavery. They abandoned the use of annular ware bowls in favor of whiteware plates. The archaeologists also saw the increased use of decorative objects like blue beads and copper bracelets. At one level the Mitchelville blacks may have been mimicking the "master class," adopting and exaggerating traits they observed among plantation whites in the effort to distance themselves from slavery. But the use of these jewelry items also likely represents a retention of an earlier African tradition, similar to the survivals of basket making and naming practices. Other differences between slavery and freedom were also found by the archaeologists. Medicine vials are not as common at Mitchelville as they are on plantations, suggesting that freedom brought better living conditions. 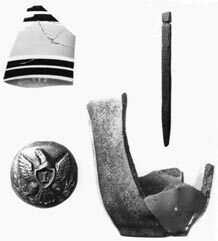 and while tobacco pipes are very common at slave sites, they were rare at Mitchelville, suggesting again that freedom brought changes in the lifestyle of the Sea Island blacks. Curiously, freedom was not equated with bigger houses. In fact, given the opportunity to build any size house they wanted (the wood was being provided free), Mitchelville's freedmen typically built houses substantially smaller than they had in slavery. This may also be related to their African roots and the importance of the yard area for family activities.